Lawn care is a crucial part of being a homeowner. In some neighborhoods, homeowners associations dictate how tidy you must keep your grass. But even without your neighbors’ disdain, an unkempt lawn is not pretty to look at and makes the house itself look rundown. To get this job done with a minimum of effort, you will need a reliable lawn mower that is easy to push. Homeownership comes with a lot of costs, though, and you may not want to drop a bundle on just one piece of the home maintenance puzzle. Don’t worry – we can help you find the best self propelled lawn mower under $300. What Makes A Mower Self-propelled? Pushing a lawn mower through grass can be exhausting. Basic gas-powered rotary mowers typically weigh anywhere from 60-90 pounds. Battery powered mowers weigh less, but still require significant effort to navigate. That’s why a self-propelled mower is a good investment. These machines basically propel themselves via a drive wheel – you just need to hold on and steer. The drive wheel that propels your mower can, like a vehicle, control the front wheels, rear wheels, or all of the wheels. The type you choose should depend on the sort of terrain you have to mow. Rear wheel drive is best for hilly landscapes. You also maintain forward motion when you tip the mower up to turn it around. Front wheel drive is great for mostly flat land, and some people find that it is actually easier to turn the mower when it stops pulling forward as the machine is tipped onto the back wheels. All wheel drive, though a bit more costly, can offer the best of both worlds. Look for all wheel drive if mobility is a challenge for you in general. A self-propelled mower can’t “get away from you” because it is engaged by holding back a trigger bar. When you let go, the mower stops moving, even if the engine remains engaged. 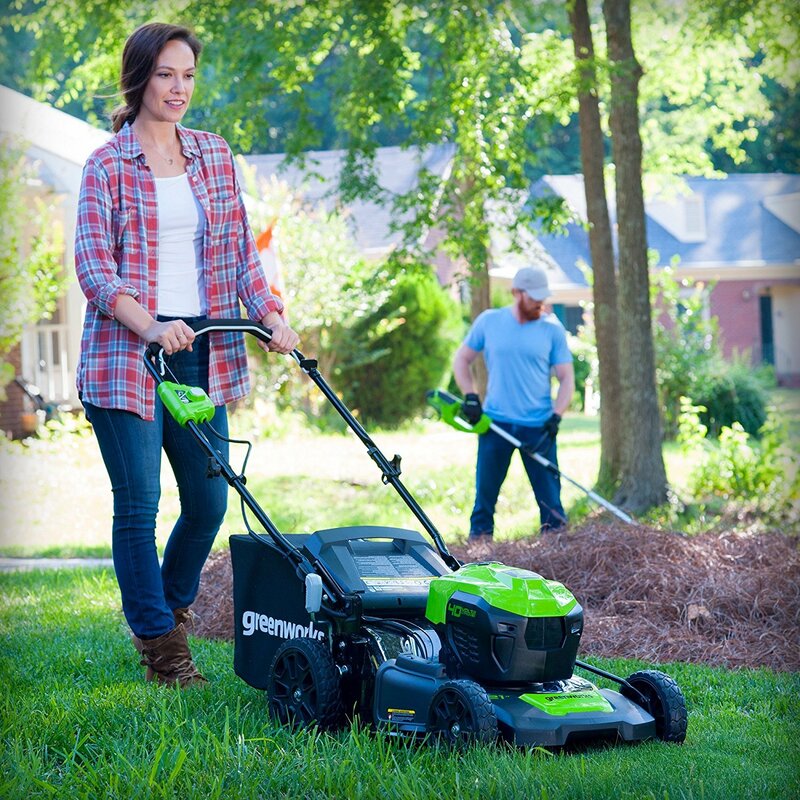 However, you don’t want to feel like you’re being dragged along, so look for a mower with variable speed settings. Following is in-depth information about these powerful and easy-to-use tools. The Remington RM310 offers a powerful 159cc OHV autochoke engine and front wheel drive for superior maneuverability. You can direct the clippings into an optional collection bag, but this mower has something called a SureCut blade that lifts and circulates as it cuts. That means you can spread mulch evenly as you mow, rather than dropping it in clumps across your lawn. Mulching is a great, not to mention, free, way to fertilize your lawn and keep it from drying out. 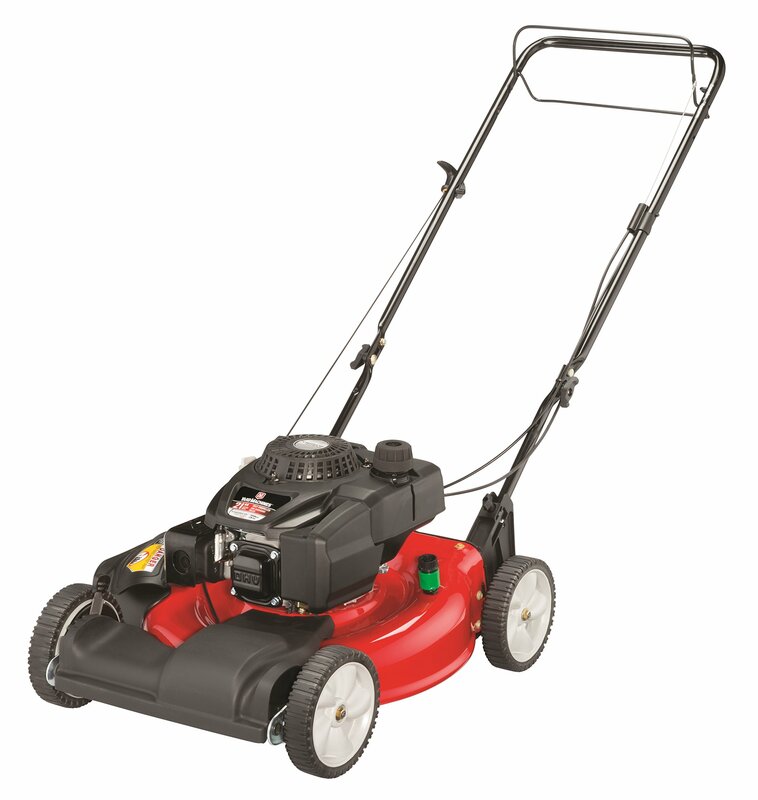 You’ll get a nice 21” cutting swath with this mower, and the deck is built tough out of sturdy rust-resistant steel. No matter how tall or short you prefer your grass, you’ll be able to find the right height setting with 6 possible positions to choose from. This Remington also has a variable speed option so that you can move at a pace that’s comfortable for you. All four wheels are 8” and durably made. It is comfortable to use, as well. If you have multiple users of your lawn mower, you’ll appreciate that the handle is adjustable. No one will have to stoop over while mowing. The grip is also padded, which minimizes the vibrations you’ll experience in your hands and wrists. Many users say that this mower is simple to put together and use right out of the box, and they love how easily it starts. You can buy this product with confidence because it also comes with a two year warranty. It certainly belongs in the category of best gas lawn mower under $300. This Lawn-Boy mower is powered by a Kohler XTX OHV 149cc engine that is guaranteed to start easily. The manufacturer offers a 3 year Tru-Start Commitment, which means that they will fix your mower for free if you doesn’t start after one or two pulls. That’s really nice, because no one wants to get sweaty and frustrated just preparing to mow! The mower features rear wheel drive for better traction control. That makes it ideal if your land is hilly, but it also works very well on flat terrain. Make short work of mowing with a 21” cutting swath and get just the right grass height with an easy 2-point deck adjustment system. If you decide to bag your clippings rather than let the mower mulch them, this model comes with a large collection bag that doesn’t need to be emptied repeatedly while you’re working. A gas mower in general will emit more fumes than an electric lawn mower, but this one is relatively eco-friendly with the CARB Compliant seal that allows it to be sold in all 50 states. (The state of California has tighter restrictions that prohibit the sale of some smoggy mowers.) The Lawn-Boy is also easy to maintain in that you never need to change the oil – just pay attention to the level and add more as necessary. This mower comes with a 3 year warranty on the engine, and a 2 year warranty on the entire unit. As long as you use and maintain your mower as described in the manual, you can rest assured that the company will honor one of the best full warranties in the industry. This Yard Machines model has a nice 159cc OHV engine and is great for small to medium sized yards. It has a 21” cutting swath and a sturdy steel deck. The engine is no-choke and no-prime, so it starts easily. The wheels are all 8” but can be adjusted independently to achieve the right clearance for your particular terrain. Being a front-wheel drive model, it is ideal for mostly flat lawns. There are a few extras that you sacrifice to get a self propelled mower at such a great price. For example, there is no collection bag. However, this machine does have mulching capability and a side discharge. There is also only one speed, so you’ll need to be comfortable working at a fast clip. The height adjustment feature is controlled by two levers, which means it’s not something you can do on the fly. Still, you should be able to achieve the right cut for your yard with just a moment’s attention to the deck height. There is no padding on the handle to minimize vibrations, but some users have improvised their own with an inexpensive foam pool noodle or similar material. If you’re looking for an inexpensive lawn mower for small yard spaces, you will be happy with this Yard Machines model. It is reliably self propelled and does its job well. The manufacturer supplies a 2 year limited warranty with your purchase. There are really not very many self propelled lawn mowers that come in at less than $300, so sometimes you’ll have to compromise in order to get one. In this case, save money by buying a battery-powered mower without the battery included. It sounds crazy, but hear us out. The Greenworks company produces over 25 different yard tools, and they can all use the same 40V battery. If a lawn mower is just one of the power tools you’ll need to keep your yard in great shape, consider buying all Greenworks products. Then, you’ll need just one battery (and perhaps a second as a back-up) to power everything, saving money overall. 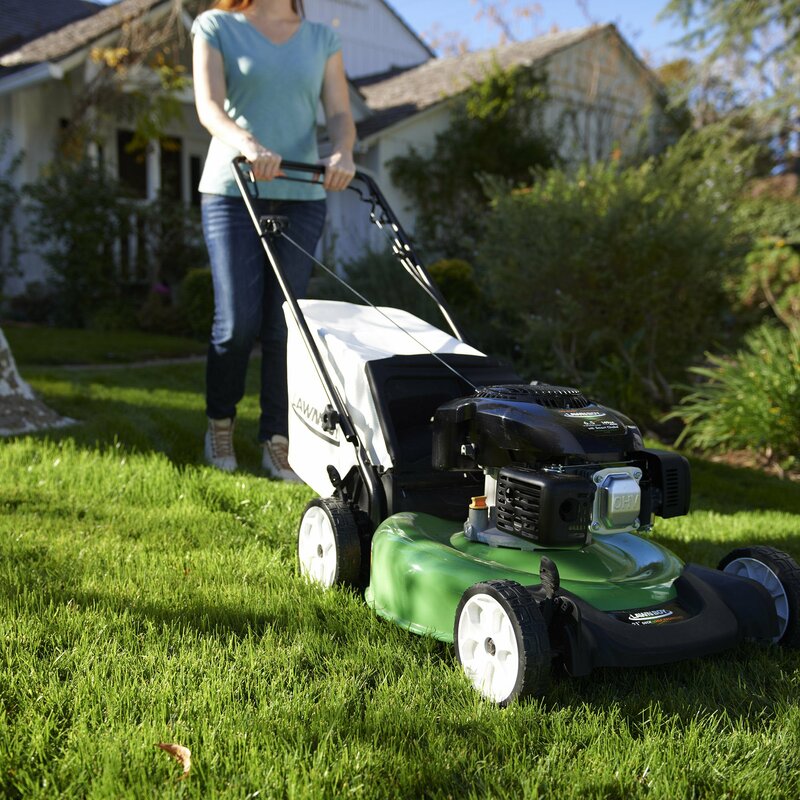 A battery-powered electric lawn mower also saves quite a bit of money in terms of the gasoline, oil, and maintenance associated with gas powered models. They are also quite a bit friendlier to the environment and make much less noise during operation. This Greenworks mower has rear wheel drive and a strong 21” steel deck. It has side discharge, mulching, and bagging capabilities. There are 7 possible height settings, controlled by a single lever. A couple of nice extra features are the extra battery compartment so that you can keep your spare close at hand, and the vertical storage option that save a lot of room in your garage or shed. 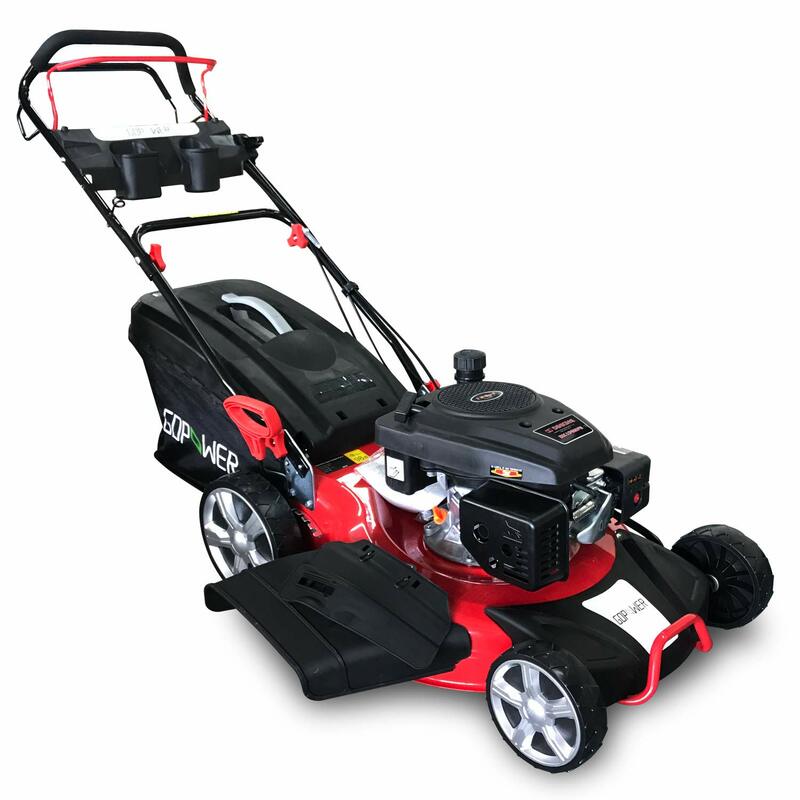 This GDPOWER self-propelled lawn mower from Piedle has a surprising number of features for such an affordable machine. The only place you might compromise is with the 20” cutting swath, but this is only one inch smaller than average and probably won’t require too many extra passes to complete the yard. A small lawn mower is easier to store, too. The deck is built with durable steel and the mower is powered by a 150cc OHV engine. There are 8 height settings ranging between 1-3” so that you can choose your ideal grass height. This mower also offers 4 options for the cuttings: rear bag, side discharge, mulching, or rear discharge. It is a rear wheel drive machine with sturdy 10-inch wheels for easy maneuverability and superior balance. In terms of ergonomics, you get a comfort-grip padded handle designed to minimize vibration. The collection bag offers an ample 65L of storage before you’ll need to stop and empty it. This mower also features two plastic compartments near the handle, perfect for a water bottle, cell phone, or random items picked up from the ground as you mow. There is a lot to love about this mower; the only downside might be the relatively short 1-year limited warranty. Any power tool is going to require some maintenance in order to get the longest possible life out of it. Your self propelled lawn mower is no different. However, outside of a pre-season trip to the repair shop for a tune-up, there is a lot that you can do yourself to keep your mower in top shape. Following are some suggestions to get the most from your investment. Lots of folks simply toss this booklet out, but it’s really important to at least glance over it and store it someplace accessible. The manual provides important info about how to correctly use, store, and maintain your lawn mower, and much frustration could be avoided by educating yourself before you turn it on. The manual also details types of usage that will void the warranty. The last thing you want when you need a repair is to find out that your warranty won’t be honored. Lawn mowing is a messy job, and those clippings tend to get everywhere. 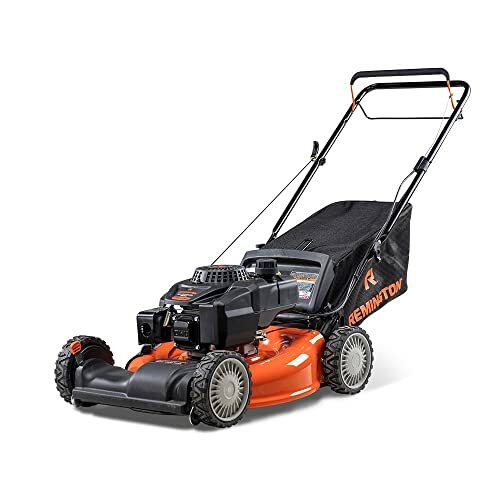 When they build up around the cutting blade and other internal components of the mower, they can reduce its performance and eventually cause damage to the unit. After every couple of mows, it is important to wash away all the grass and weeds, dust, gravel, twigs, and animal waste that accumulates. Some mowers make this really easy with an included washout port to which you can attach a regular garden hose. But even if you don’t have this feature, it’s pretty easy to tip over the mower and rinse it out. Don’t, however, use your fingers to pry out any stuck twigs or other material. Instead, attempt to dislodge it with a wooden stick. If it’s really in there tightly, head to a service shop so you don’t damage any components – or your hands! A clean air filter is an important component because your mower needs a steady supply of fresh, clean air in order to work. A clogged air filter puts excess stress on the engine, and it will eventually overheat. How often you change the air filter depends on how often you mow the lawn, and how much dust gets kicked up when you do. Check it every few weeks, and replace the filter (or clean it, if it is a reusable one). All gas engines need a spark to burn fuel. This is provided by a spark plug. It is best to replace your mower’s spark plug once per season, even if the old one hasn’t completely died. Spark plugs decline in effectiveness over time, so installing a new one means the engine will start more easily and you’ll enjoy better fuel economy. Though it may feel wasteful to buy a new spark plug when the old one still works, in the end you save a lot of money in fuel by keeping the spark plug in optimal condition. Your gas-powered lawn mower needs clean oil to prevent seizing. Some newer models of mower don’t require oil changes, only that you refill the oil compartment as it gets low. This is another reason to read your manual! If you do need to change the oil, it is best done when the engine is warm but not hot. The oil will be loose but you won’t burn yourself. Carefully collect the old oil as it drains into a plastic container with a lid. Never throw old oil away – it needs to go to an appropriate recycling center. Finally, make sure the drain hole is securely closed again before you refill the oil reservoir. Watch the fill line carefully to avoid overfilling and always use the type of oil noted in the user’s manual. Sharp blades are a must for a nice lawn. If you’ve ever mangled a vegetable with a dull knife in the kitchen, you can probably guess what happens to your grass when cut with a dull mower blade. It rips the grass blades and leaves jagged tears that actually leave your grass open to disease. Dull blades can also rip grass out by the roots, leaving scalped sections of bare dirt. And finally, ripped grass does not look as nice as cleanly cut grass. Sharpening should be done about twice per season, more if you have a huge yard, mow more than once per week, or mow multiple yards with the same mower. Blade sharpening is something most users can do on their own with the right sharpening tool, but if you’ve never done it before, you may want to take the mower in for service and ask if you can watch how the sharpening is done. We’ve shown you 5 dependable self propelled lawn mowers that are great for anyone on a budget. The labor required by you is significantly reduced by choosing a self propelled model, so you can tackle both the front and back yards without getting exhausted. You may sacrifice comfort upgrades and other fancy features with these mowers, but they all get the job done. Sometimes, that’s all you need. So which is the best self propelled lawn mower under $300 for you? However you choose, we think it is going to be a beautiful summer!